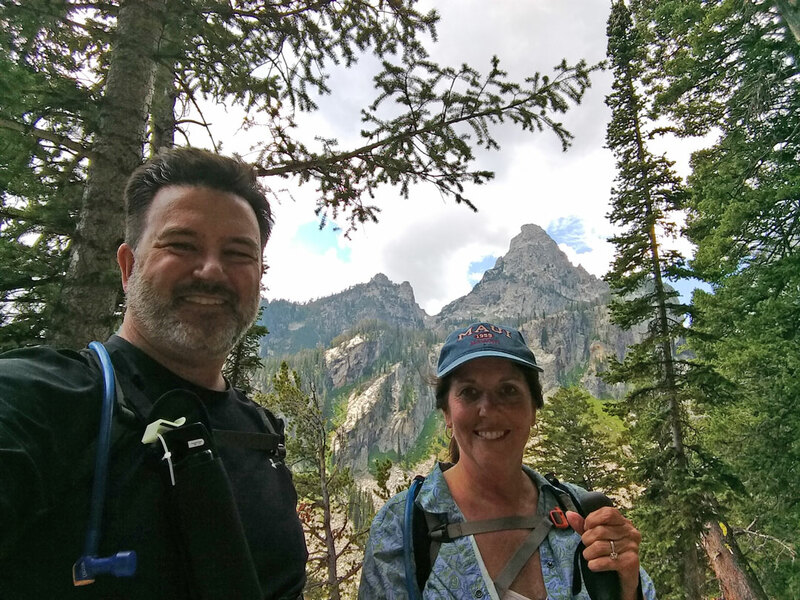 We knew we would be hiking in Grand Teton National Park, but we had not chosen which trail to hike until the day before our hike. I had a list but was still doing research and we wanted to go with one that fit the way we felt when the time came. 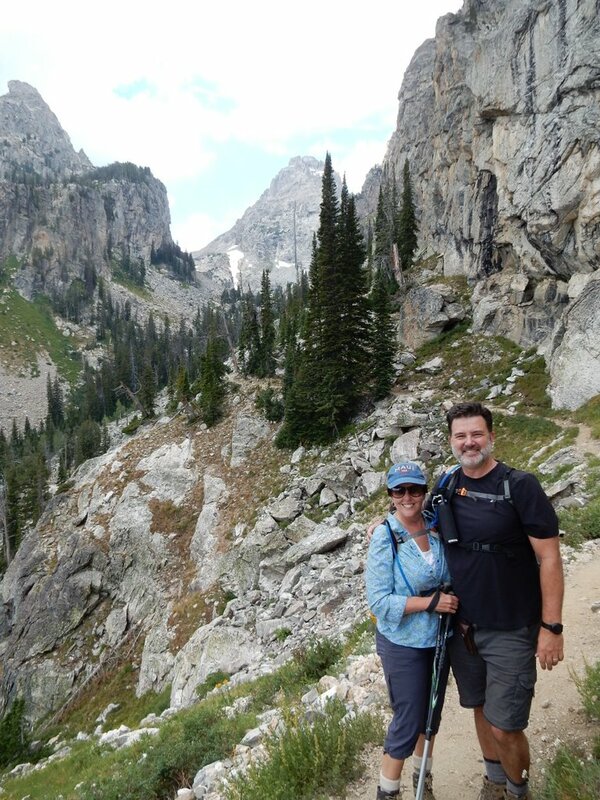 I’m not sure what source of info I was looking at, whether it was a National Park Service brochure, or some other guide, but the hike that jumped out at me was described as the easiest hike to an alpine meadow in the Grand Tetons. Easy sounded good and getting up high enough to feel like we were actually “in the Tetons” sounded great too. 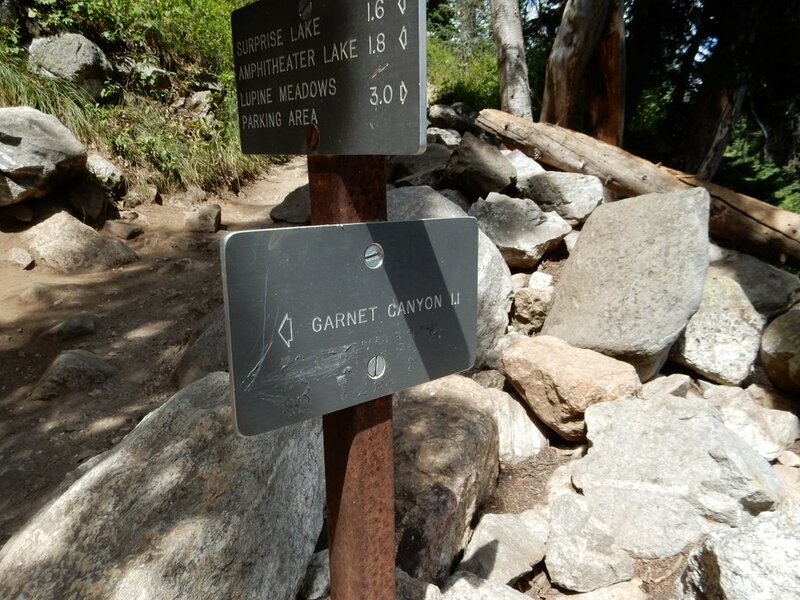 I do recommend Garnet Canyon Trail, but I would not in any way call it an easy trail. 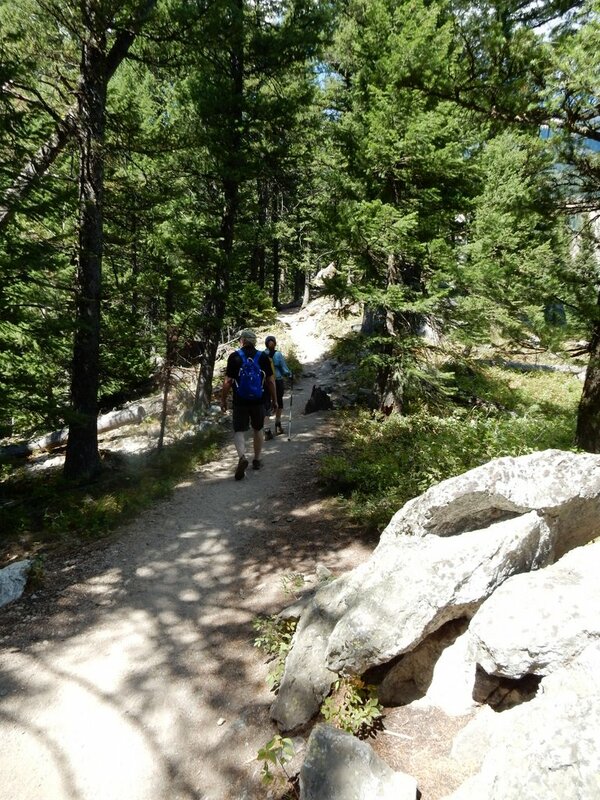 It is 8.4 miles out and back and over 2200 feet of climb. 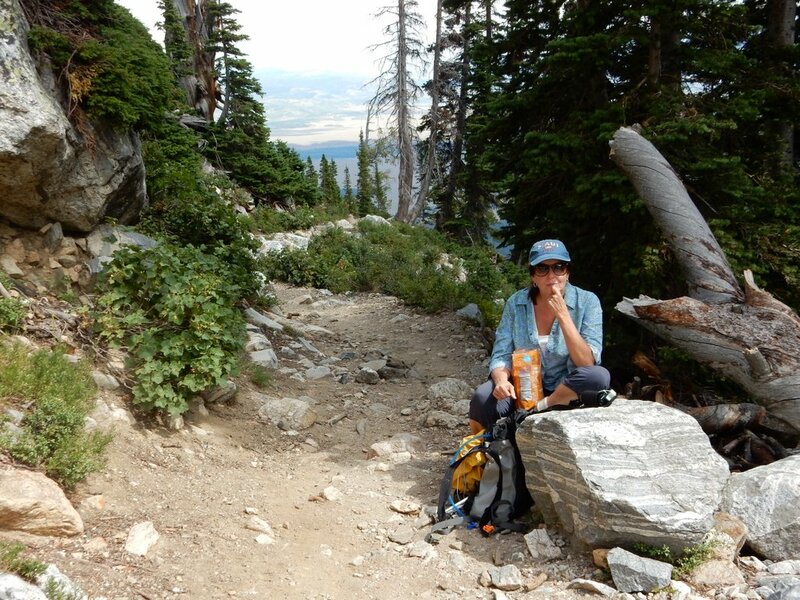 It is a very strenuous climb, and for much of the hike you will have panoramic view out over Grand Teton National Park, but you will have very little to look at “up the mountain”. But when you do finally get views “up the mountain”, they will take what little breath you have left away! We got up fairly early to have breakfast, but we weren’t in a huge rush to get started. The temperature would be very reasonable even in the middle of the afternoon. We met up with Jenny’s cousin Charles to go with him on the hike. He had stayed nearby so we met at our hotel and then headed into downtown Jackson to get a light breakfast and a large coffee at Jackson Hole Coffee Roasters. The service and the coffee were very good. The drive to the trail head was not bad from Jackson. 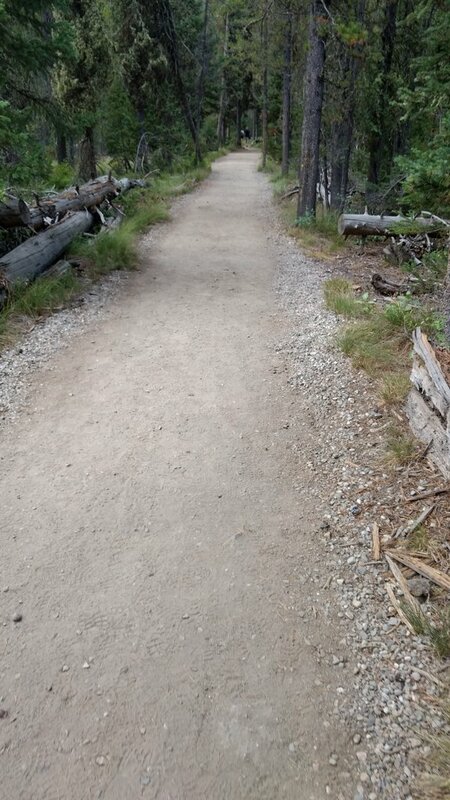 We stopped at the visitor’s center briefly, then headed to the Lupine Meadows Trailhead. There is plenty of parking and it was fairly clear how to get to the trailhead from where we parked our car. We wasted no time in hitting the trail. The trail starts with a very misleading long flat stretch. But eventually the trail turns toward the mountain and begins to climb. 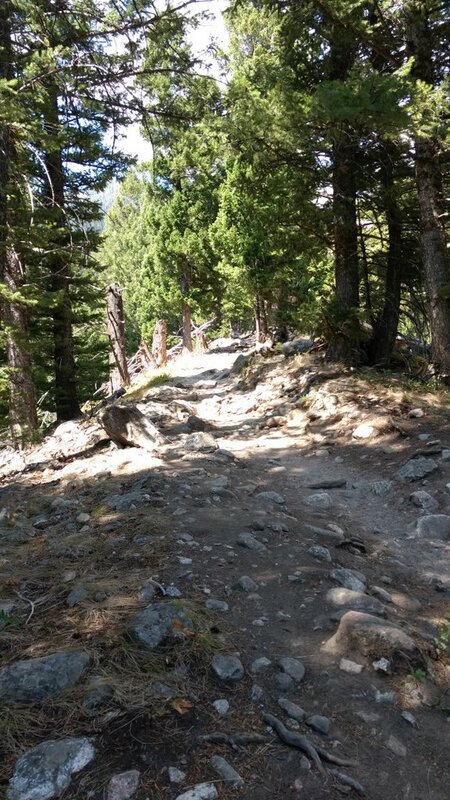 The trail heads steadily straight up the mountain, gently at first and then getting steeper before starting long sweeping switchbacks. I may have under sold the lower parts of the trail in my intro. The trail climbs through the trees for much of the lower part of the trail. 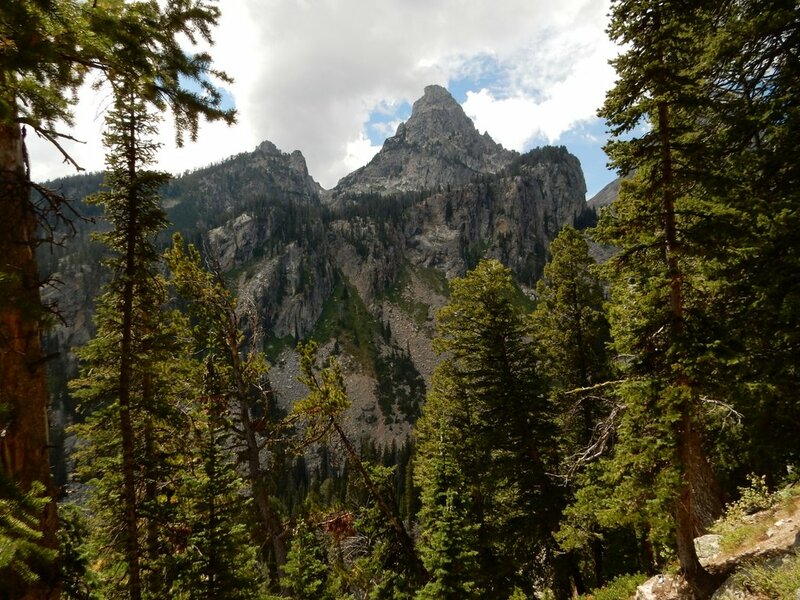 If you look up during the start of the hike you are likely to catch a glimpse of the Grand Teton peak through the trees. 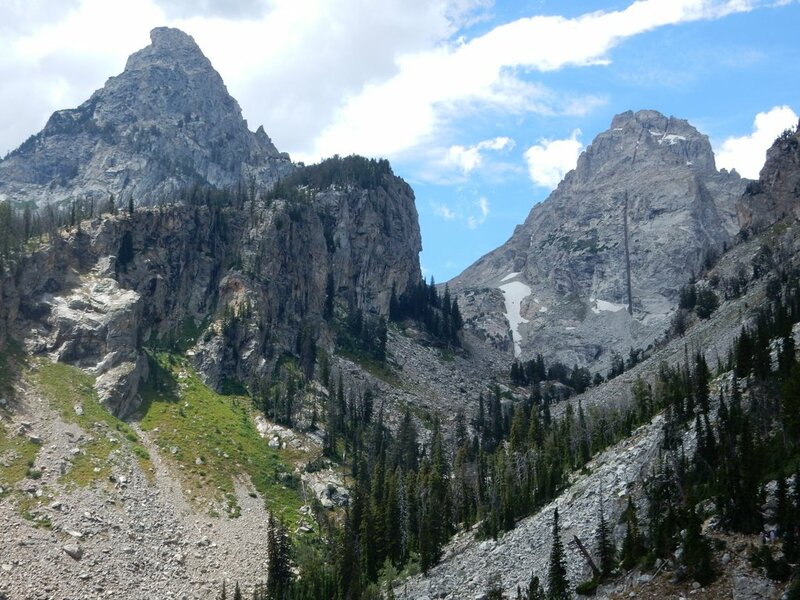 As you head up the trail further you won’t be able to see this peak, but you will be much closer to the Middle Teton and Nez Perce peaks. But before you get to that you’ll have lot’s of views out over the park, including some great views of Taggart and Bradley lakes at the base of this part of the mountain. After about a mile and a half Charles went ahead of us quite a ways. We were not in the best “hiking” shape we could be in and we were also struggling a bit with the altitude. We kept a nice steady pace, but it was sort of slow. When we got to the 3 mile mark there is a fork in the trail which is well-marked. Charles was waiting for us at the junction. 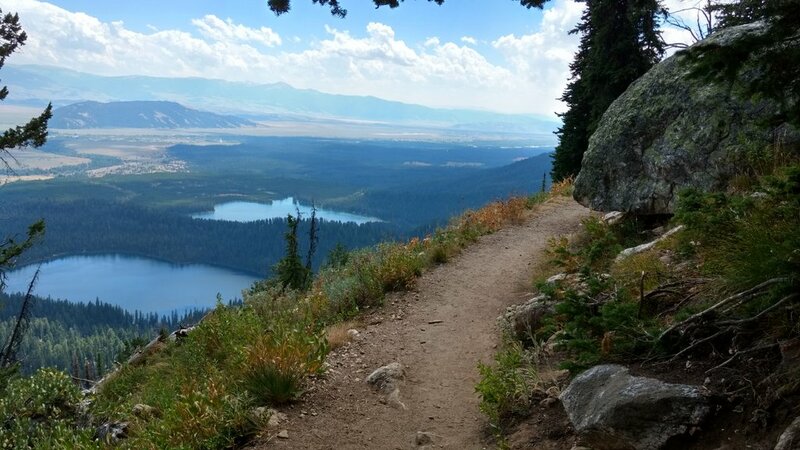 The trail heads further up the mountain to some high mountain lakes. 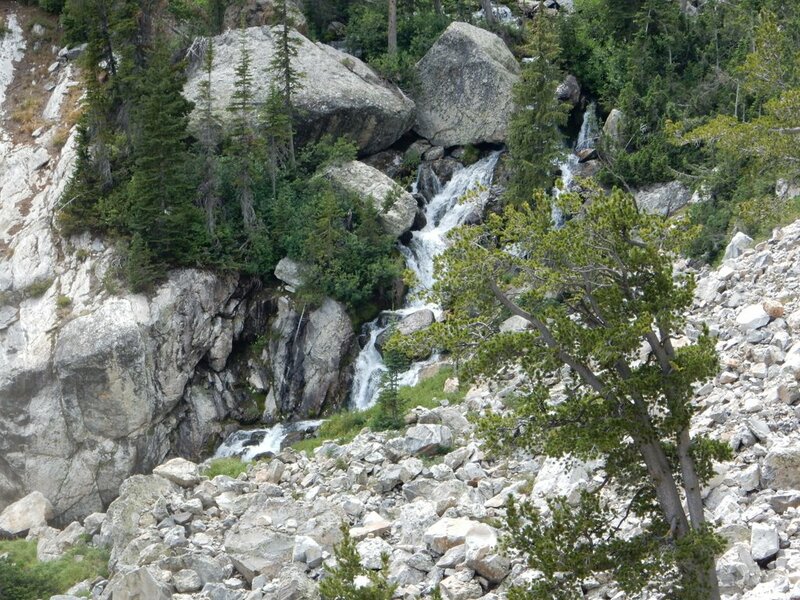 We talked to a couple of groups who were backpacking to this area to camp. 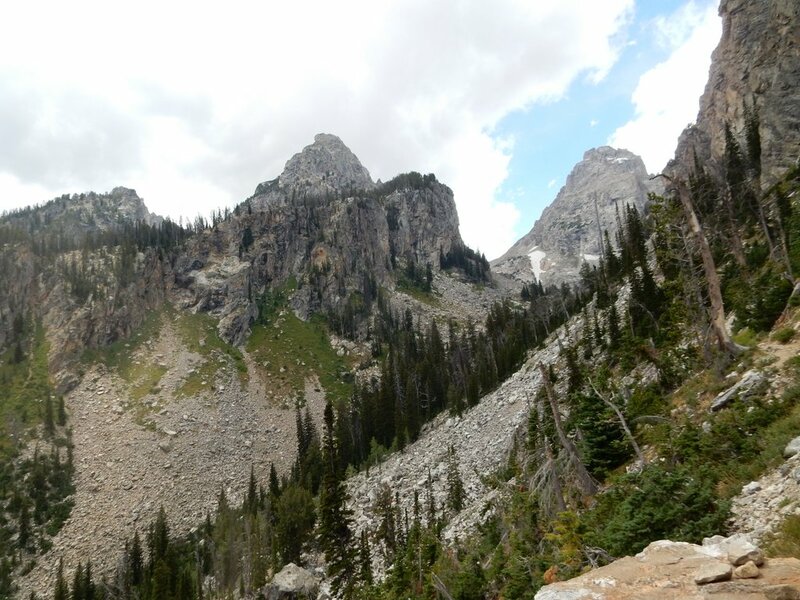 We would be heading the other direction, more around the mountain than up it, to Garnet Canyon. Charles made a pitch to head back down instead, and decided he would head back either way. Although I was really feeling my lack of conditioning at that point, I was for continuing on. We decided to continue as we knew there would be some great view ahead of us. After the junction the trail toward Garnet Canyon levels out quite a bit. The hike is easier, but we were pretty tired by this point. 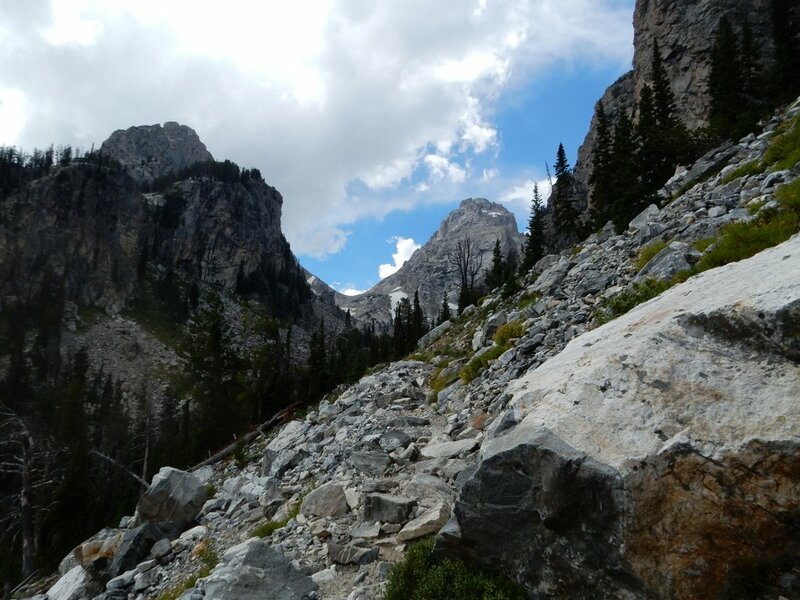 As we rounded the corner and headed onto the trail directly above Garnet Canyon excitement replaced fatigue. 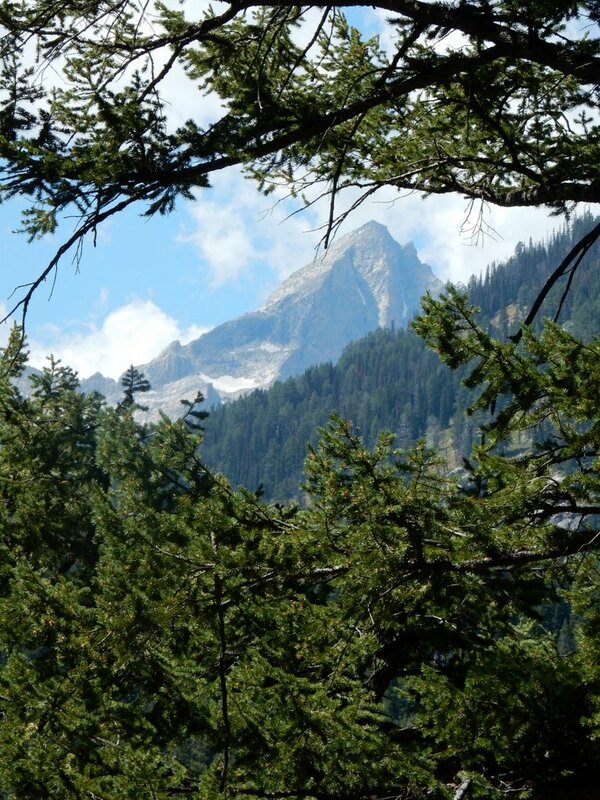 The Nez Perce peak came into view first. There was no one else around so we took a quick selfie with this peak behind us. We were tired, but happy we had continued. The bear spray we had bought the previous day while checking out the Grand Canyon of Yellowstone River was hooked up and ready on my chest. Luckily we would not need it during this trip! From this point the views would only get more spectacular. 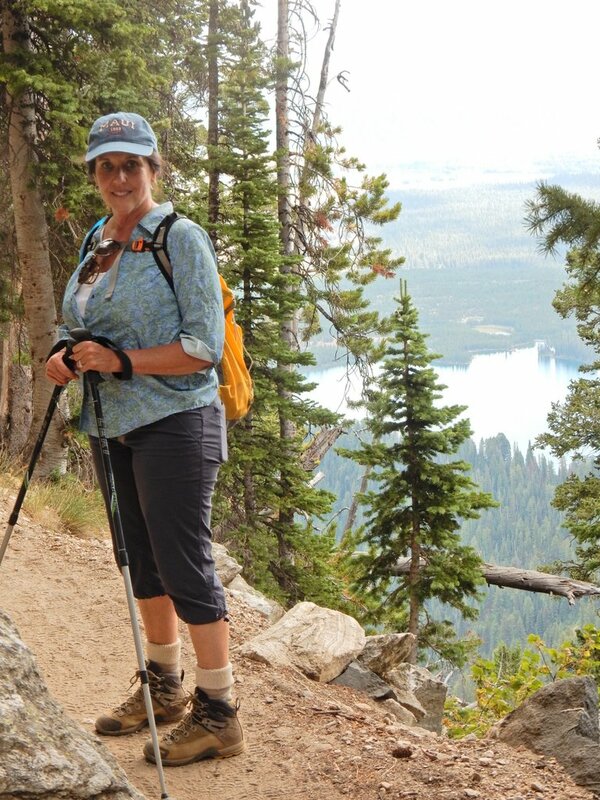 Just a little further up the trail we got a great view of both Nez Perce and Middle Teton peaks. Just a little further up the trail we ran into a group of hikers coming back down the trail. They let us know it was not much further to the end of the trail. They also took this picture of us. with a very sweet view! At this point the line of lava going up the face of the Middle Teton was very obvious. and one last view up the canyon at the point I turned around. The first part of the descent was beautiful all over again. I love when you get to see things from a different angle on the way back down a trail. 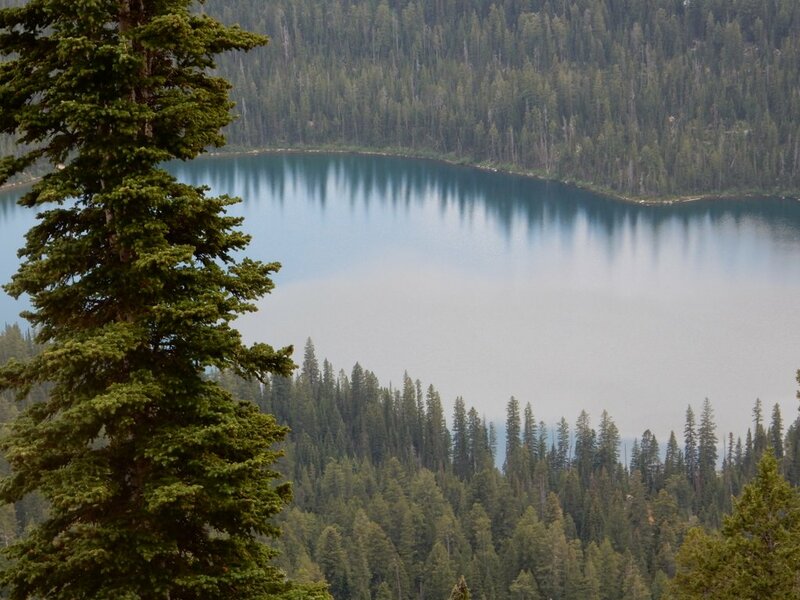 In this shot, the lighting was perfect to see the pines reflecting on Bradley Lake from our angle on the trail above the lake. As we got closer to the bottom though we started to feel it again. Sometimes going down can take it out of you too. I prefer going down hill, but for Jenny it is harder than going up. 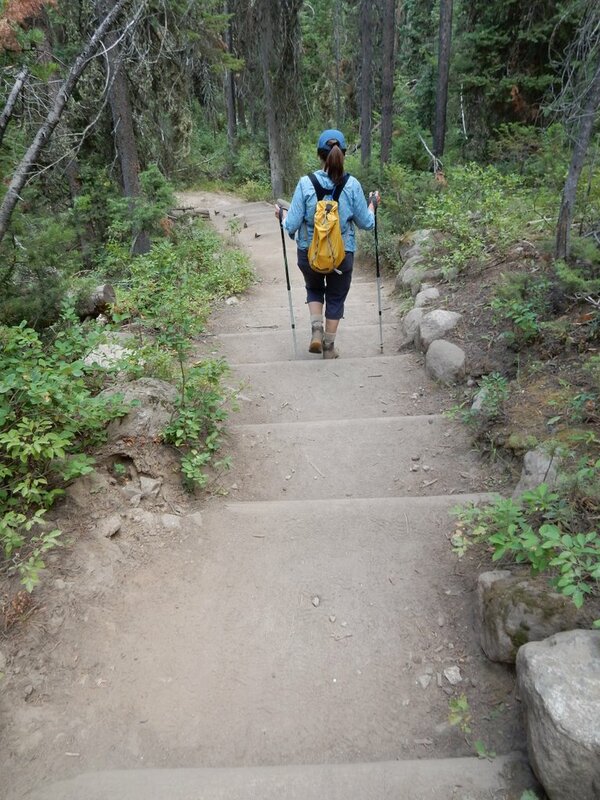 Hiking poles help, but a good smooth well maintained trail helps too. We were glad to come to landmarks that let us know we were getting close to the end. 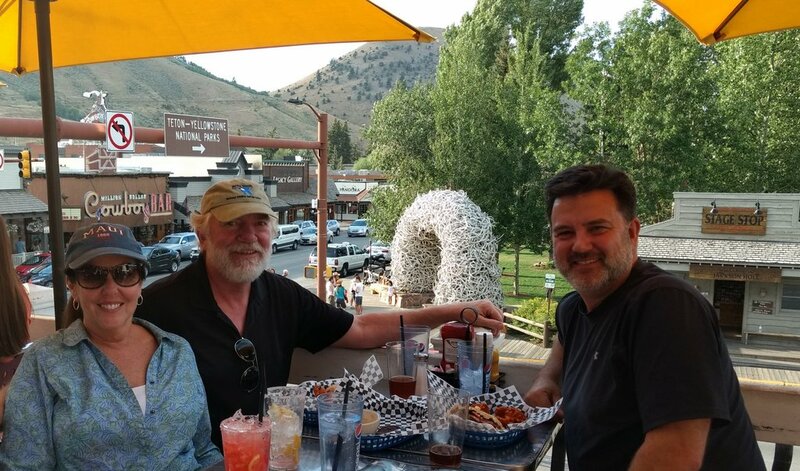 We woke Charles up from his nap at the car and headed back to Jackson for a light dinner and a well deserved beer! I’m finishing this post up on December 31st 2016. During this trip I started to think of myself as “in the worst shape of my life”. I’ve done nothing in the nearly 5 months since this trip to change that. Over the last year I’ve only been in the gym intermittently, I’ve been unable to run, and I’ve not hiked enough to really make a difference either. It is a bit cliché, but I’m going to resolve to change my routine in the New Year. It may be a slow start as I have foot surgery near the end of January, but once I’m recovered from that I’m hoping to be able to get back to running. Before the surgery I plan to get a good start on getting out of the worst shape of my life! I have way too many things I want to do to be “out of shape” any longer. Update Feb 13, 2017: I got a good start on getting out of “the worst shape of my life” before my surgery. It has been 3 weeks since my surgery and today was my first day in a regular shoe! The foot is healing fast and already feels better in many ways than it did before the surgery. So glad to have the irritating hardware out of my foot. I’m hoping to get in to the gym by the end of this week (about a month post surgery) for some weight training and maybe a light elliptical workout. I have an all-inclusive resort on white sand beach to prepare for!